David Rodman Annable (born September 15, 1979) is an American actor. His roles include Justin Walker on the ABC television drama Brothers & Sisters (2006–11), Henry Martin on the ABC supernatural drama 666 Park Avenue (2012–13), and Pierce Harrison on the NBC medical drama Heartbeat (2016). Annable was born in Suffern, New York. He grew up in Walden, a village in New York, where he played baseball, rugby and hockey. His father is Christian and his mother is Jewish, and he was "raised both". Annable attended Valley Central High School and graduated in 1997. He attended college at the State University of New York at Plattsburgh (SUNY Plattsburgh). There, he became involved with the student-run TV station, Plattsburgh State Television (PSTV), working both on production behind the scenes and on the air as well. He hosted many shows at PSTV, including Late Night with Dave Annable, Cardinal Sports, and The Roommate Game. Annable credits Plattsburgh State Television for preparing him for his successful career in television. Annable dropped out of college in 2003 to pursue his acting career. After leaving SUNY Plattsburgh, Annable studied acting at the Neighborhood Playhouse in New York with Richard Pinter. In 2002, Annable made his acting debut in an episode of the NBC crime drama Third Watch. Annable has appeared in numerous commercials for brands such as Mountain Dew, Starburst and Abercrombie and Fitch. In 2004, Annable appeared in the films Little Black Book and Spellbound. In September 2005, Annable began appearing as Aaron Lewis on the Fox drama series Reunion, which centers on six friends who attend their 20th high school reunion, where one of them is murdered and all of them are suspects. In December, Fox cancelled the series due to low ratings shortly after the ninth episode aired. The WB reportedly showed interest in picking up the series on their network, but these plans never materialized. In 2006, Annable was cast as Justin Walker on the ABC drama series Brothers & Sisters alongside Calista Flockhart, Rachel Griffiths, and Sally Field, which was picked up for a full season by the network. In 2007, Annable was ranked as #7 on People magazine's annual list of Sexiest Men Alive. 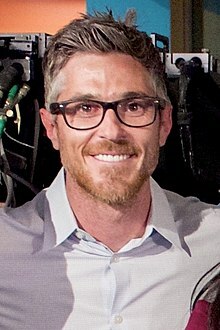 In 2008, Annable won a Prism Award for Best Performance in a Drama Series Multi-Episode Storyline for his portrayal on Brothers & Sisters. The series ran for five seasons until 2011. In January 2012, Annable was confirmed to star as the male protagonist on the ABC supernatural drama series 666 Park Avenue alongside Rachael Taylor, Vanessa Williams and Robert Buckley, which was picked up for a first season of 13 episodes in May. The series debuted in September only to be cancelled by November and removed from the network's schedule in December. 666 Park Avenue returned to ABC in June 2013 to burn off its remaining episodes. In 2014, Annable starred on the Fox series Red Band Society, where he played the role of pediatric oncologist and surgeon Dr. Adam McAndrew. In 2016, he appeared as Pierce Harris on the NBC medical drama Heartbeat alongside Melissa George and Don Hany. Both series were also cancelled after one season. In 2016, he landed recurring role as Teddy Grant on Fox's comedy series The Mick alongside Kaitlin Olson. On April 5, 2016, it was announced that Annable joined the WWE Studio action film Armed Response alongside Wesley Snipes and Anne Heche. The movie was released in theaters on August 4, 2017. He also starred as author Joe McGinniss in Jeffrey MacDonald true crime murder movie Final Vision on Investigation Discovery. On August 3, 2017, Annable was cast as Lee Dutton, a cowboy, who serves as his father’s (Kevin Costner) right-hand man in running the ranch, in the pilot episode of Paramount Network's period drama Yellowstone. He starred as Billy opposite his real life wife Odette Annable in a Freeform holiday movie No Sleep ‘Til Christmas. Annable had a relationship with his Brothers & Sisters co-star Emily VanCamp beginning in 2007, who later became his love interest on the series. He married Odette Yustman on October 10, 2010, who was also a love interest of Annable's character on the final season of Brothers & Sisters. They have one child together, a daughter born in September 2015. Five years after dropping out of college, Annable earned his diploma from SUNY Plattsburgh on May 16, 2009. In addition to earning his degree, Annable was awarded the "Off To A Good Start" award and gave a commencement address to his fellow Class of 2009 graduates. Completing college was a promise he made to his mother. 2002 Third Watch Doug Maple, Jr. Episode: "Firestarter"
2013 Ben and Kate Professor Greg Episode: "Ethics 101"
2017 The Mick Teddy Grant Episode: "The Master"
2018 Yellowstone Lee Dutton Episode: "Daybreak"
^ "Hollywood Now: New Fall Previews". Interfaithfamily.com. Retrieved 2 October 2014. ^ "Hollywood Now: Interfaith Stars and How They Raise Their Kids - InterfaithFamily". www.interfaithfamily.com. Retrieved 2 October 2018. ^ a b Bergeron, Bryan (May 1, 2009). "Annable, 'off to a good start'". Cardinal Points. Retrieved 2009-05-17. ^ "Dave Annable". Tvsa.co.za. Retrieved 2 October 2014. ^ "Dave Annable - Other works". IMDb. Retrieved 2 October 2014. ^ "Dave Annable". IMDb. Retrieved 2 October 2014. ^ "Reunion (TV Series 2005– )". IMDb. Retrieved 2 October 2014. ^ "Reunion: Killer's Identity Revealed for Cancelled Fox Show". Tvseriesfinale.com. Retrieved 2 October 2014. ^ "Reunion". TV.com. Archived from the original on 6 October 2014. Retrieved 2 October 2014. ^ "'Brothers & Sisters' to Make Its Debut on ABC". The New York Times. Retrieved 2 October 2014. ^ "Upfronts Announcement: NBC's Schedule for 2006-2007 Season". IGN. Retrieved 2 October 2014. ^ "The Sexiest Men Alive". People. November 26, 2007. ^ "Breaking: ABC Cancels Brothers & Sisters and V – TVLine - TVLine". TVLine. Retrieved 2 October 2014. ^ "Advertisement". Variety. Retrieved 2 October 2014. ^ "Updated (5): ABC Picks Up Comedies 'The Neighbors' and 'The Family Tools' and Dramas 'Nashville,' 'Red Widow' and 'Zero Hour' + More". Tvbythenumbers.zap2it.com. Retrieved 2 October 2014. ^ "Comic-Con 2012: '666 Park Avenue' Keeps the Mystery Going, Crowd Celebrates Terry O'Quinn's Birthday". The Hollywood Reporter. 13 July 2012. Retrieved 2 October 2014. ^ "ABC 2012-13 Primetime Schedule: 'Revenge' To Sunday, 'Happy Endings,' 'Don't Trust The B' To Tuesday, 'Last Man Standing' To Friday". Tvbythenumbers.zap2it.com. Retrieved 2012-06-22. ^ Porter, Rick (July 26, 2012). "ABC fall 2012 premiere dates: 'Revenge' and 'Modern Family,' plus 'Suburgatory' gets a new timeslot". Zap2it. Retrieved July 26, 2012. ^ Seikaly, Andrea. "Dave Annable Joins Fox Pilot 'Red Band Society'". Retrieved 2015-08-21. ^ Wagmeister, Elizabeth. "Dave Annable Lands Male Lead in NBC Medical Drama 'Heart Matters'". Variety. Retrieved 2016-04-06. ^ "New TV series 'Heartbeat' based on female surgeon's life". Lansing State Journal. Retrieved 2016-04-06. ^ Petski, Denise (2016-10-10). "'The Mick': Dave Annable Set To Recur In Fox Comedy". Deadline. Retrieved 2017-01-05. ^ Kroll, Justin (2016-04-05). "'Heartbeat' Actor Dave Annable Joins WWE Production 'Temple' (EXCLUSIVE)". Retrieved 2016-07-13. ^ Wagmeister, Elizabeth (2016-12-05). "Scott Foley, Dave Annable to Star in Jeffrey MacDonald True Crime Murder Movie on Investigation Discovery". Variety. Retrieved 2017-12-09. ^ Petski, Denise (2017-08-03). "'Yellowstone': Dave Annable, Gil Birmingham Set As Leads, Wendy Moniz To Recur In Paramount Network Series". Deadline. Retrieved 2018-01-22. ^ Petski, Denise (2018-06-27). "Dave & Odette Annable To Star In Freeform Movie 'No Sleep 'Til Christmas'". Deadline. Retrieved 2018-07-14. ^ Jordan, Julie (October 11, 2010). "Dave Annable and Odette Yustman Wed". People. Retrieved February 11, 2019. ^ Leon, Anya (September 10, 2015). "Dave and Odette Annable Welcome Daughter Charlie Mae - See Her First Photos!". People. Retrieved February 11, 2019. ^ "Dave Annable accepts the Off to a Good Start Award from SUNY Plattsburgh" (video). YouTube. Retrieved 2009-05-16. This page is based on the Wikipedia article Dave Annable; it is used under the Creative Commons Attribution-ShareAlike 3.0 Unported License (CC-BY-SA). You may redistribute it, verbatim or modified, providing that you comply with the terms of the CC-BY-SA.